Most of us consider our garages to be safe places to store our things. That big, heavy door, solid walls and concrete floors make the garage seem like a nearly impenetrable fortress. But is your garage really secure? Perhaps not, but there are some simple ways you can make it safer. First, keep the door closed. This may seem obvious, but sometimes it’s easy to forget, especially if you have several family members going in and out. Next, store the garage door remote inside your house. It’s convenient to keep it in the vehicle, but it’s also easy for thieves to find. If someone breaks into your car and the remote is there, he or she has easy access to your house. A keychain remote opener may be the best solution because you can leave it on your keys and never forget it as you enter and exit the house. Lock the inside door. A deadbolt on the door that leads from the garage into your house is a good deterrent for thieves. Make sure that the door to your garage is a strong as the front door of your house, and install a peephole so that you won’t have to open the door for every strange noise. Choose a garage door with no windows. If that’s not a possibility at the moment, frost or cover the windows, so thieves can’t look in and see when your car is gone. Secure your emergency release handle. This is easy to do, just by connecting a zip tie to a loop in the emergency latch. You could also just remove the emergency pull, being aware that in the case of an emergency it will take a few minutes more to release the garage door. Maintain your door. Pay attention to all the mechanical parts of your garage door, and make sure nothing is corroded. Check the frame, lock, hinges, and any replaceable items on the door from the garage to the house, and the exterior side door, if applicable. Take additional security precautions. Install a garage door alarm and motion sensor lights. If there’s a side door to the outside, use the kind of doorstop that screws into the ground and keeps the door from being compromised. Install a new door if necessary. Choose a sturdy garage door, made of metal or solid wood and strong enough to stand up to anyone trying to break in. Especially on older homes, garage doors are often low-quality, and not as sturdy as the ones on newer homes. If you need garage door repair or maintenance, new security features for your garage door, or are ready for a new garage door, contact A1A Overhead Doors Company today. Family owned and operated, A1A Overhead Door serves the entire metro Jacksonville area. In fact, we even go up to fifty miles into the outer countries. We are licensed and insured to cover both the client’s property and ours, and we’re proud to work with our clientele and math or beat any competitor’s written estimate. For more information, you can call 904.579.1123 or contact us through our website. The garage door is a complex piece of hardware some of us use every day. We open it in the morning to back our car out and close it as we head off to work. Then we return home in the evening and open and close it again. If we have a family, our spouse will also use the garage door to get their vehicle out to go to work, run errands, or take the kids to school. Not to mention, your kids will open and close the door to get their bikes and toys out. Plus, you will be opening and closing the door on the weekends when you do yard work or other things around the home. With so much use, it is a wonder garage doors last as long as they do. Yet periodically, they do need some general maintenance and care to keep them working correctly. If you ignore performing maintenance, then your garage door could break. If that happens, then you need to decide if the garage door repairs are something you can handle or if you need to call in a professional technician for help. Before we get into the various repairs, let’s first look at garage door maintenance tips. Inspect the Door: You want to look for dents, dings, cracks, and other areas where the door is not sealing. Check at the bottom to make sure you cannot see light from the outside, as well as along the sides. Inspect the Door Hardware: Look at the hinges, springs, lift arm, and other hardware used to open and close the door for any signs of rusting or damaged parts and components. Inspect Door Tracks: The door tracks should not be bent or misaligned. The wheels on the door hardware should roll when you open and close the door. Check Door Supports: Check to make sure no anchor screws have come out of the overhead door supports or tracks. Replace Automatic Opener Batteries: Once a year, replace the batteries in your remote garage door openers. Lubricate door hardware with an appropriate product: Your garage door technician can let you know what product to use to keep hardware lubricated and working correctly. Wash the door: You can use a gentle detergent, like a car wash soap and a soft cloth to wash the door. DO NOT use a power washer, as this can take paint off the door. A garden hose with an attached nozzle is all the pressure you need to rinse the door off. Maintenance should be performed at least twice a year, as well as after any major storms. If you discover any problems, you need to get these fixed as soon as possible. Now that we’ve covered what maintenance you should be doing, let’s look at when things go wrong. Broken Springs: Springs are under constant pressure. When one breaks, you will know, it as it makes a huge banging sound. Garage door springs should be replaced by a professional to ensure they are installed correctly. Not to mention, this repair is one that requires taking the right safety precautions. Broken Hardware: If it is just a single hinge, then you may be able to do the repair yourself. On the other hand, if you have to replace multiple hinges or other hardware, you will want to get help from a professional. Broken/Cracked Door Panels: Even though the door panels look like they are not heavy, they do weigh a lot. This type of repair requires at least two people that know how to safely replace the panels. It is not an easy DIY repair. Broken Wheels: If the wheels are locked and no longer turn, they need to be replaced. You have to be careful when replacing wheels to not bend the door track or cause other damages. It is for these reasons you should rely on an expert. Missing or Damage Weather Stripping: Replacing weather stripping is a DIY repair you can do on your own. It is not hard to install new stripping on the sides or under the door. However, for stripping in between door panels, you should call your local garage repair technician for help. Dents and Dings: You may be able to use a plunger to get out some dents and dings on your own. If they are deeper, then it may be time to replace the damaged panels or upgrade to a new door. Broken Automatic Opener: Automatic openers have many different moving parts and components, as well as electrical wiring. 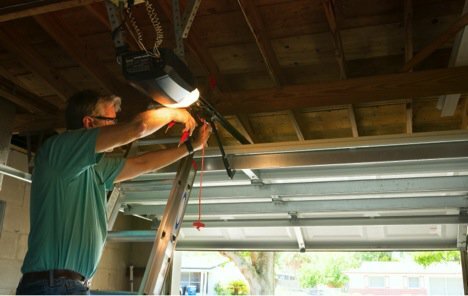 Due to electrical hazards, it is best to have a garage door technician do the work. As with other complex hardware, it is essential to know when things are just beyond your skills. 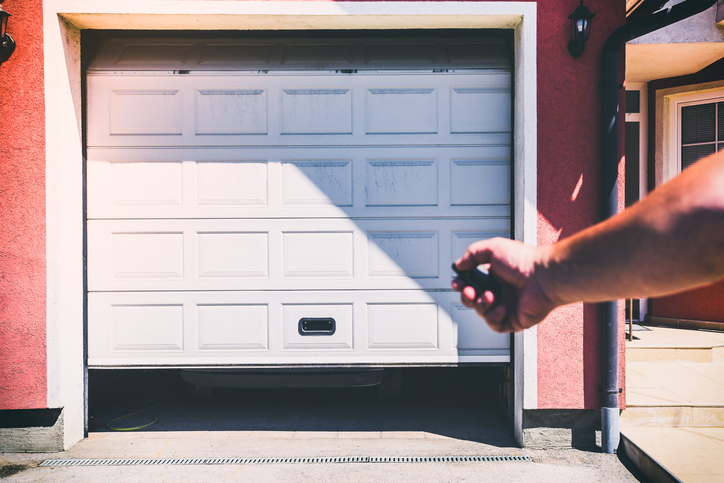 There can be certain risks and hazards of attempting certain garage door repairs on your own that could lead to additional door damages and personal injuries. In addition, it may be more beneficial and cost-effective to have a new door installed rather than repair your existing one. If your garage door and the opener are getting to the point where repairs are becoming a common occurrence, it is time for a new door. Even if your door is still working fine, but is more than five years old, you could gain some added benefits by upgrading to a new overhead garage door . Better Insulation: You can improve the energy efficiency of your home and garage with an insulated garage door. The insulation helps keep the garage cooler in summer and warmer in winter, which also can help lower your energy bills. Stronger Doors: Here in Florida, you need a strong door to stand up to tropical storms and other severe weather. Modern doors are much stronger today and meet or exceed current hurricane building codes. Appearance: Getting a new door is an easy way to change the exterior appearance of your home. If the door is faded, dented, dinged, or simply looks bad, then get a new one. Not only will your home be more appealing, the new door could increase the value of your home. Safety/Security: New doors and garage door openers have improved safety and security features—for instance, reverse door sensors to stop the door from closing when something or someone is under it. There are also security keypads you can get installed to open the door from outside when you do not have the remote control opener, as well as “pin-based” and smartphone app openers. Better Insurance Rates: Some insurance companies offer a discount on your house insurance for installing a new garage door with improved insulation and added safety and security features. Quieter Openers: Modern door openers are much quieter when combined with the right garage door hardware components. Battery Backup Features: In the event of a power outage, you no longer have to try to figure out how to disengage the automatic control arm from the door with a battery backup upgrade. You will be still able to open and close the door for a short period of time. Several of these benefits could result in the new door paying for itself over a period of time, such as reduced energy bills or lower insurance premiums. For all types of garage door repairs , or to find out your options for upgrading to a new garage door, please feel free to contact A1A Overhead Door Company at (904) 821-8463 today! We service the entire Jacksonville metro area as well as up to 50 miles into the outer counties. The garage door on your home is not something you might think much about so long as it is working. The only time you truly notice the door and all its parts and components is when something goes wrong. This is when you call a garage door repair technician to have them come fix your door . It is not uncommon for many people to be unfamiliar with garage door terminology. Before we discuss some of the more common garage door problems you can experience, let’s do a review of garage door basics. This will help you have a better understanding of what can go wrong. There are several working parts and components which make up the entire garage door system. These can be broken down into three specific categories: the door itself, hardware components, and weather-stripping. There is some general information you need to know in regards to the door itself, which can affect how it functions. 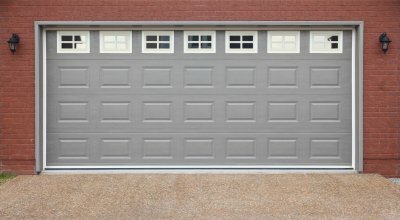 Garage doors can open either vertically (up and down) or horizontally (left and right). Garage doors can be insulated or uninsulated. Insulated doors are ideal for the warmer Florida climates, as well as in colder northern climates. Insulated doors have an R-value, which tells you how effective they are at insulating your garage. Doors with higher R-values have more insulation to keep out the hot and cold. Certain types of doors are better at standing up to tropical storms and hurricanes. 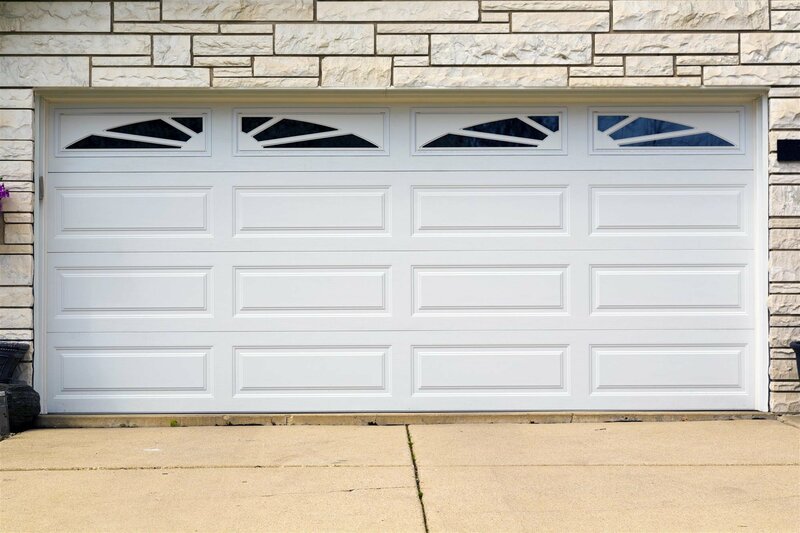 Garage doors can be made from aluminum, vinyl, wood, steel, fiberglass, and PVC materials. Some styles of doors will feature windows as part of their design. The most common types of door used on homes in Florida are vertically opening, sectional doors. When it comes to the garage door’s hardware, this is where things can start to become a bit confusing for most people. If you look on the backside of the door, you will see a variety of components. These work together in perfect harmony to open and close the door when everything is working correctly. Lifting Cables: Your door could have lifting cables, which are attached to the door’s springs and aid in opening and closing it. Hinges: The hinges are located in between each sectional piece of the door. They help to keep the door in place and allow each section to bend as the door is opened or closed. You can tell the quality of the door by looking at the hinges. Better-quality doors use double hinges, which better support the weight of each door section. Door Rollers: On the side of garage doors are small rollers or wheels. As the door is opened and closed, the wheels should turn freely inside the door tracks. If you want a quieter opening door, consider upgrading from galvanized steel to nylon door rollers. Door Tracks: The tracks are those metal pieces attached to the sides of the doors to allow it to open and close easily. In most homes, the tracks are suspended and secured to the garage’s ceiling. Garage Door Opener: The opener is a motorized device attached to the garage door to automate opening and closing. The opener has its own specific parts and components, including a lifting arm, manual disconnect, and chains. An important feature your door should have is weather-stripping. The stripping is what keeps rain and water from getting into the garage. It also blocks out wind when it is sealed correctly. On the bottom of the door, there should be some sort of rubberized weather-stripping to stop water from running under the door and into the garage. Now that you have a better understanding of garage door basics, let’s talk about some of the more common problems and repairs. Broken Springs: The springs on your garage door are designed to open and close the door a set number of times. Eventually, they will break, and you will know it if you are at home. When a garage door spring breaks, it makes a loud noise, almost like a firework going off in your garage. At this point, attempting to open or close the door can be very dangerous. There can still be tension left in the spring, and it could knock the door off its tracks, as well as cause personal injuries if it snaps off. If the spring breaks on your garage door, do not try to open it. Instead, call and schedule garage door repair service immediately . You should also stay out of your garage until after the door has been fixed. Broken Cables: Cables can break on their own from normal wear and tear or from the stresses placed on them when springs break. If a cable is broken, one side of the door may appear to be “sagging” compared to the other. That side of the door may also seem heavier. You may also notice the door is slightly angled and lower on one side as it opens. If all the cables are broken, the door may not stay in place when it is opened. Instead, it will fall down as soon as you lift it up, which can be a serious safety risk. Sticking Rollers: The rollers on the sides of the door should spin and turn. If they are stuck and sliding, this can cause the door to come off its tracks. Stuck rollers can also make opening and closing the door noisier. Door Closes and Reopens: This type of problem occurs when the automatic garage door opener needs to be adjusted. Openers have door limit settings which control the open and close functions. Periodically, from normal usage, these can require slight adjustments and resynching. Essentially, the limit settings let the door know how far it should move to be fully closed or opened. If these are off, when it touches the ground the sensors on the opener translate this as hitting an object, not the ground, so the door reopens. Another cause for this type of problem is if something is in front of the door sensors. Toward the bottom of the door, about four to six inches off the ground will be sensors on each side of the door or on the interior wall of the garage. These sensors detect if something is in the way and will cause the door to reopen. Door Opens But Won’t Close: This problem is often related to the sensors. If the lenses get dirty, or there is something directly in front of them, they will prevent the door from closing. Clean the lenses and verify nothing is in the way of the sensors. If the door still won’t close, then it is time to call a garage door repair technician. The Door Sticks or Stops: A sticking door can be quite common from changes in humidity levels to a lack of proper lubrication on moving parts and components. It could also be caused if the door is no longer level and needs to be realigned. If the door doesn’t open and you have power, verify the opener is plugged in and the breaker has not blown. Once verifying these things, if the door isn’t working, it could mean an electrical problem or that the opener needs to be replaced. Of course, appearance should be a significant part of the decision-making process when selecting a new garage door. After all, if your garage faces the road, then this aspect of your home’s exterior can have a big impact on your property’s curb appeal. For this reason, when considering your options, be sure to think about what garage door color and style might be best suited to your home’s style and color. One way in which one garage door can differ from another is in its insulating qualities. This factor matters because even if your garage isn’t one of the heated or air-conditioned areas of your home, choosing an insulated option for your new garage door may improve your home’s energy efficiency and contribute to lower home heating and cooling costs. How much insulation a garage door can provide can depend on its material. For example, aluminum and steel garage doors are usually less insulating than those made of other materials. However, there are many garage doors available that are insulated to provide better thermal efficiency. Typically, for any home that has an attached garage, choosing an insulated model for this home investment can be a wise decision. 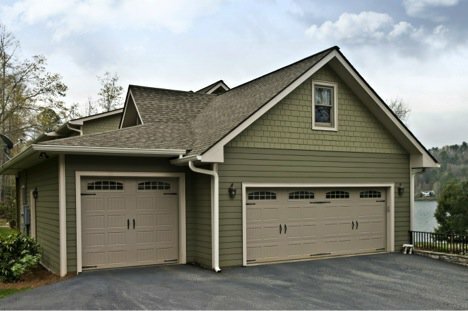 Installing a new garage door is a way to add better safety and security to your home. For example, by choosing a garage door system that includes an electronic keypad, your garage may be less at risk for theft. Also, if you live in an area that gets tornadoes or hurricanes, then investing in a garage door that is designed to withstand heavy winds can be a smart option that helps provide extra protection for your property. Parents often go to great lengths to help ensure the safety of their children, but there are some hazards that even the most vigilant of caregivers are not aware of. Whether you need garage door repairs or just installed a new garage door in Jacksonville, FL, there are a number of things to know about when it comes to keeping kids safe around this part of your home. One common garage door-related injury among children is injured fingers, as they can get their fingers trapped between the segments of a moving garage door. Also, kids sometimes get caught underneath garage doors as they are closing. For these reasons, you should make sure that your children are well away from the door before opening or closing it. To help protect your kids from garage door injuries, encourage them to remain away from the door at all times. Also, you should try to be a good remodel and avoid ducking under the door as it is closing. Finally, take care of any necessary garage door repairs sooner rather than later to help promote the safety of you and your family. 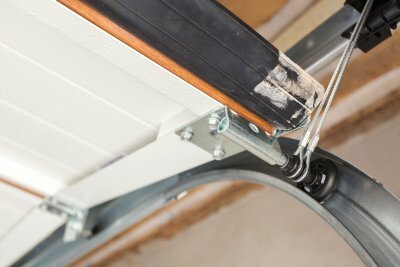 What Are the Common Signs of a Broken Garage Door Spring? 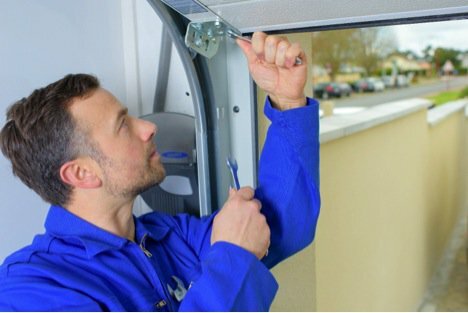 Spring replacements are among the most common types of garage door repairs that homeowners need. Are you wondering if you’re dealing with a broken spring and need garage door repairs near Fernandina Beach ? If so, then there are several signs for you to look out for. If you have a broken garage door spring, then the cables may be loose or detached, you may hear loud noises when the door is in motion, or you might see a break in the torsion spring. Also, if the garage door lifts only partway, lowers too quickly, isn’t level, lifts shakily, or is bent on top, then you may be dealing with a broken spring. 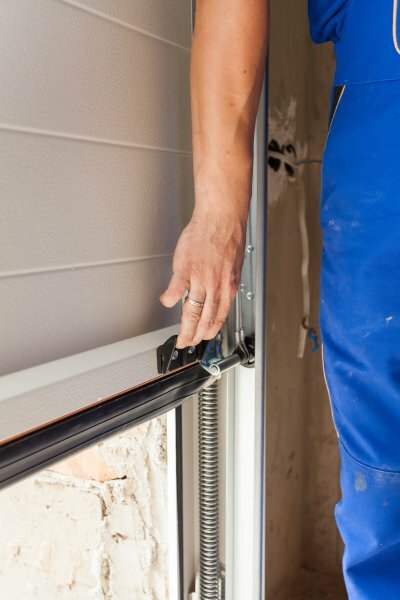 What it comes to garage door repairs that involve spring replacement, these jobs are better left in the hands of professionals, as homeowners frequently end up injuring themselves when attempting to DIY this task. If you believe that you’re dealing with a broken spring, then consider calling your local garage door repair company. For many homeowners, the effect that storms can have on their garage door opener never crosses their mind until a problem comes up. Continue reading to learn what garage door experts in Jacksonville, FL would want you to know about what lightning damage to your garage door opener may look like. Lightning strikes can do significant damage to electronics, including your garage door opener. If your opener has been affected by lightning, then you may find that the device no longer powers on following a storm. If your garage door opener doesn’t seem to be getting any power, then rule out other possible causes, such as an unplugged power cord or a tripped circuit breaker. After ruling out other potential issues, you should consider calling a garage door repair company. Another warning sign of lightning damage to a garage door opener is a remote that no longer seems to work. If, after replacing the remote’s batteries, you still can’t get it to open the garage door, then the problem may be inside of the opener. The lights that you see illuminated on your garage door opener when it is working right are indicative of properly functioning electrical wiring. If, after a storm, you notice that the illuminated LEDs on your garage door opener are different than usual, then this may indicate that lightning has damaged the device. In particular, if the device’s warning light is on, then consider calling a garage door repair company to inspect the opener for damage. When a garage door opener is functioning as it should be, then it opens the garage door consistently when directed to by a working remote. For this reason, if your area recently received lightning and now your garage door opener is only working some of the time, then its poor function may indicate that it has been damaged. Instead of waiting for the opener to fail again when you’re busy or running late, consider scheduling garage door repairs today. Judging when you are far enough from your new garage door in Jacksonville, FL when parking in your garage isn’t always an easy task. If you struggle to park your car exactly where you want it when you get home, then watch this video for a simple trick to try. Start by getting your car where you would like to park it. Next, find yourself a tennis ball, some nylon string, and two eye hooks. Then, twist one of the eye hooks into the tennis ball before tying the string to the eye hook. Lastly, twist the second eye hook into the garage ceiling and then tie the other end of the string to the eyehook so that the tennis ball rests against the windshield. Now, you will know exactly where to stop when parking your car in your garage. 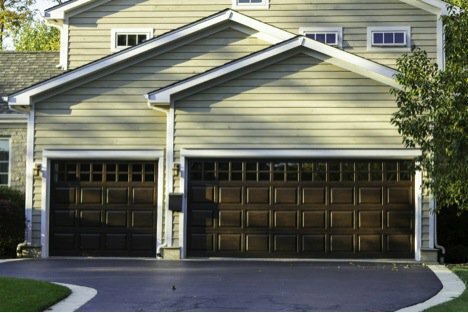 Your home’s garage door can have a significant impact on the overall look of your home, which means that coordinating it with the rest of the building’s exterior can be essential for maximizing your property’s curb appeal. If you have already taken care of garage door replacement near Ponte Vedra but need to coordinate this feature with your home’s new paint color, then watch this video for tips on painting your garage door. If your garage door is paneled, then consider renting a paint sprayer, as it can be challenging to paint all the angles of a paneled surface using brushes and rollers. Before you begin, create a protective awning around the edges of the door to help ensure that you don’t get paint on your home’s siding. Also, to be sure that you cover all the areas, aim the sprayer down, straight, and up as you work. Are you considering garage door replacement in Jacksonville, FL but aren’t sure about what specifications are required? If so, then read on to learn the answers to some common questions about Florida’s garage door hurricane codes. Why is garage door hurricane code compliance important? The wind velocities that hurricanes can produce can do significant damage to even sturdy, rigid buildings and their components, and this includes garage doors. A hurricane can destroy a garage door by pulling it outward, pushing it inward, or removing it entirely, possibly causing damage to vehicles in the process. Also, if a hurricane’s winds manage to bend the door or remove it from the home, then this can leave the building more vulnerable to hurricane damage. For these reasons, garage door replacement can be a smart option for Florida homeowners whose garage doors aren’t up to code. 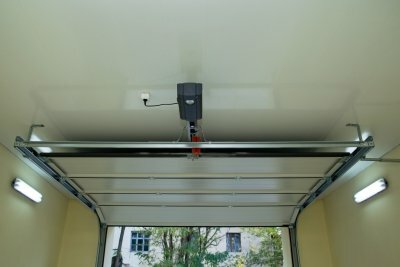 Do I need to worry about garage door replacement for hurricanes? If you own an older home or if your garage door is not relatively new, then you should consider investing in a newer and more durable garage door. 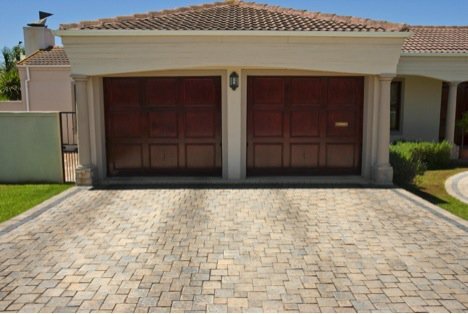 Older garage doors are typically more vulnerable to hurricane force winds, and the damage that they can suffer may lead to additional problems such as water and roof damage. How do I determine the wind speed requirements for my home’s location? To determine what wind speed requirements your garage door replacement should meet, you should factor in the wind exposure that your home may receive in your location, as well as your home’s structural type. You can find information about the minimum wind speed that your garage door should be able to withstand by visiting windspeed.atcouncil.org . Why do garage doors need a hurricane code? Many people assume that because garage doors are so big and heavy that there is no need to worry about them suffering hurricane damage. However, the truth is very much the opposite. It is because garage doors cover such a large opening in your home that hurricane code compliance is vital for avoiding hurricane damage.